A great skyscraper city has more than great skyscrapers, it has a great story to tell about them. Frankfurt's is shaped by (among other things) military occupation, beer, street revolutionaries, and starchitects both victorious and defeated. Frankfurt has a long banking history, but it was the Americans who primed it to ultimately become continental Europe's financial powerhouse. After the Second World War, the city lay in the American Sector, and Frankfurt's airport geared up for the 'Luftbrücke' to supply West Berlin, isolated in the Soviet Sector. 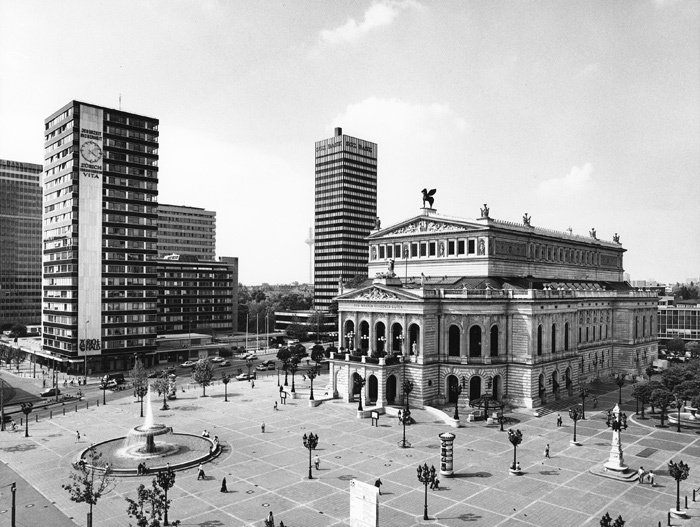 Frankfurt had aspirations to be West Germany's capital, but Bonn won that in 1949, so the city decided to become the commercial capital instead. American skyscrapers symbolised capitalism, and Frankfurt, unlike other cities, had given the green light to inner-city high-rise as early as 1947. The Bank deutscher Länder - later the Bundesbank - set up shop in 1957, anchoring a Banking Quarter. By the time SOM's (low-rise) America House opened the same year, standard International style boxes were already proliferating. A fun exception was the Henninger Turm, converted from a brewery silo, mounted by a beer barrel-shaped rotunda with a revolving restaurant. It opened in 1964, a year before London's at the (now) BT Tower. Now demolished, new high-rise flats will follow the form. In the 1960s, the centre's neighbouring Westend was slated for triple-deck road schemes and skyscrapers, and property speculators moved in. Villas and neighbourhoods were obliterated. A squatter movement rose up, and in the Seventies, skyscrapers became the left's symbols of 'Bankfurt''s capitalism. Violent revolutionary street protests flared (Joschka Fischer, later Foreign Minister, squatted and attacked police). Some wondered if the city was ungovernable. Government did improve, and so did design. It almost included Mies van der Rohe, who invented the glass, curtain-walled skyscraper in 1921 (unbuilt at Friedrichstrasse, Berlin). 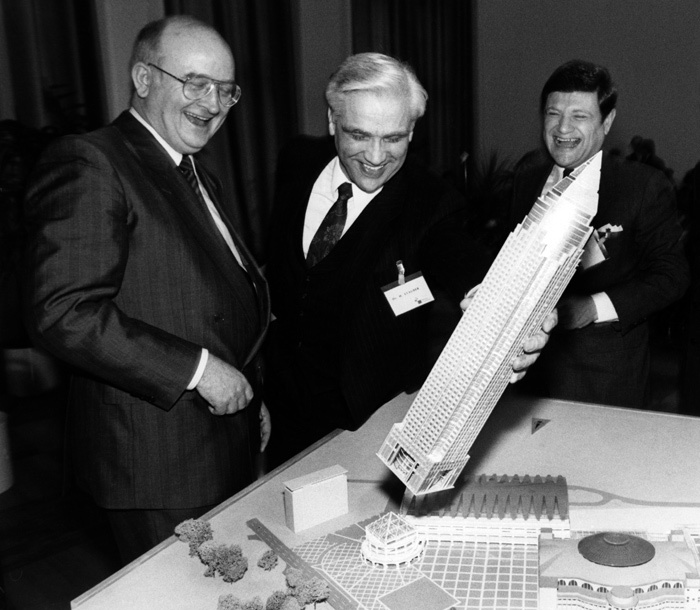 Ex-revolutionary Daniel Cohn-Bendit was a leading voice in the city's Red-Green coalition, insisting on green credentials for Commerzbank's new tower in return for doubling the height. The corporate eco-tower was born. Both Düsseldorf-based Ingenhoven's and Foster's designs introduced natural ventilation, but Foster won with his great, stacked atria between peripheral cores, one rising to 259m, making it the EU's tallest building from 1997 until The Shard. It defines the central cluster of 'Mainhattan', and (though Wolf Prix dismisses the coincidence) the atria concept is echoed in Frankfurt's newest skyscraper, Coop Himmelb(l)au's ECB headquarters. As in London, great post-war high-rise has been lost in the lust to maximise plot ratios. For example, developers Tishman-Speyer replaced the once-listed Zürich-Haus (1962), an elegantly light, 20-storey stack by Stücheli and von Schauroth with generous glazing and a clock overlooking the old Opera Square, by a 170m-high tower which was completed in 2010. That may be nothing compared to the current frenzied climb of say Shanghai, Tianjin or Manhattan, but in European terms, Frankfurt's 14 buildings over 150m is up there with London's 18 and Paris' 17. And the locals have learnt to love the skyscraper, especially after the 256m-high, postmodernist, red granite MesseTurm - by another German émigré, showy Chicago-based Helmut Jahn - wowed Frankfurt in 1991. Since 1996, Frankfurt has even had a Skyscraper Festival. In 2013, 1.2 million visits were registered for bungee-jumping, aerial shows, fireworks, music - and entry into skyscrapers. This exhibition celebrates them with meticulous research into architecture, city planning and socio-political history. It's stuffed with models, photos and plans. And there's an extra exhibit outside - DAM faces Frankfurt's spectacular Banking Quarter skyscraper cluster across the river Main. Despite its calm, contemplative mood, this show should have translated its dramatic German title: 'Himmelstürmend' - it means 'storming heaven'.